2002 Protege5 with P0037 code started losing power then wouldn't idle then died. Thread: 2002 Protege5 with P0037 code started losing power then wouldn't idle then died. Hey everyone. My 2002 Protege5 5 speed with 195k miles had a P0037 code that I noticed for a few weeks, so I ordered a rear OEM O2 sensor. While waiting for the part to arrive, the last time I drove it, it seemed to be missing most of it's horsepower which I immediately assumed was related to the trouble code. A few miles later, I had to floor it just to pull out of a parking space and a few blocks later it just died at a stop light (fun). I went and got my truck and towed it the mile or so home. O2 sensor arrives, I get under there and replace it. Car will crank, but still won't start. I noticed the battery was low on voltage after sitting for awhile, so I charged it overnight on the tender to get it to 12.53 volts. Tried starting again, no luck. Disconnected battery hoping to reset ECU (not sure if it really reset it or not) and still couldn't get it to start. Took oil cap off, notice the front camshaft spinning when attempting to start, so I assume the timing belt didn't break. Kinda spitballing here. Haven't tested any of the wires on the new O2 sensor just yet since I can't really get it going to even do that. Any ideas on what to do next? Car was previously running fine otherwise. Spark, fuel, compression, all at the right time and it will run. Firstly check for spark. Easy test is to give it a snort of ether. If it runs for a second and dies, you have a fuel delivery problem. If it doesn't, then you are not getting any spark, or you're low on compression. Tested fuel pump but not pressure. Manually switched the fuel relay by hand and a steady stream of fuel came out the disconnected return line (which went into a gas can for safety). Did a compression check and they are all at 110PSI with a teaspoon of oil. That seems low even for the altitude I am at 5,280. Oh man I hope it isn't rings or valve seals though I'd prefer valve seals. I do know that if your crank position sensor is bad, you'll get one single spark and then nothing. You may have skipped a tooth or two on your timing belt. You can remove your valve cover and check it. Your compression is below the minimum... It's supposed to be over 119 PSI. I didn't think low compression would kill a car so quickly ?? Perhaps your car went into limp mode when you threw that code and that's what broke the camels back. If your valves aren't in time, that may decrease your reading on your compression test. Rings aren't the type of thing to fail all of the sudden. At this point I would suspect that your timing belt has slipped, how many miles are on it? Oh man. I didn't know timing belts skipping was really even a thing! This one has 90k miles on it (It's the second belt. I did it the first time at 105k). You may be onto something. I'll check the alignment via taking the valve cover and side cover off and give the marks a look. the spark is continuous, so it sounds like it isn't the crank position sensor, if this single spark behavior is, in fact, accurate. Thanks for pointing that out. Thanks a tonne for the pointers and direction. I really do appreciate it. I will check the alignment of the gears next. People like you make the internet work internetting in. ... I'll check the alignment via taking the valve cover and side cover off and give the marks a look. You can use the timing marks on the crankshaft pulley but the pulley is rubber mounted to the "hub" and can slip (rotate on itself) throwing the timing marks off. The notch on the gear will be accurate but it's kinda involved to get the side cover off. ..., if this single spark behavior is, in fact, accurate. Thanks for pointing that out. Apparently, (according to testimonials on this forum) the engine will run with a bad cam sensor but not with a bad crank sensor. The ECU allows one full rotation of the engine waiting for a crank signal and then kills the spark if it doesn't get one. If you turn the ignition to off, you are given one more spark. Last edited by pcb; 04-09-2018 at 12:16 AM. ... People like you make the internet work internetting in. .. I don't have to get off the couch. If you get one of those 99 cent ($17 canadian) cup holders you hang from the window in the door, it fits nicely on the radiator support behind the driver's side headlight. Convenient beer access is critical. 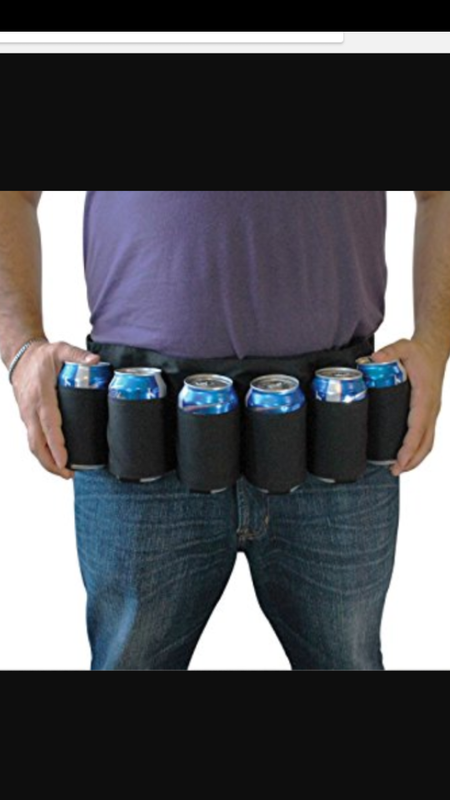 I'm kinda diggin the beer belt !! I should invest in one of these !! that would probably work better if they're insulated. Maybe up in the great white north they'll stay cold, but not down here!